Description: 1x1 football. Chose your player. Hit the ball, score the goal. 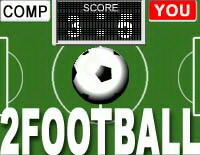 Prove, that you play football better than computer. Control: Control your player with mouse.